White Papers > Microgrid Policy > Collaborative Conversations: Microgrid Regulation … Or Not? Changing societal needs require a grid that is not just reliable and affordable, but one that is resilient and able to integrate multiple resources, including decentralized and intermittent generation, and meet evolving consumer demands. Microgrids are increasingly identified as a key element of the future grid architecture. The 2.5-hour session, entitled “Microgrid Regulation. . .or Not?,” highlighted the complex interactions between microgrids and the rest of the electric system and user communities. Microgrids occupy a multi-faceted position in the market: they are providers of distribution service to their interconnected customers and may also provide services to the grid and take service as the customer of an interconnected utility. 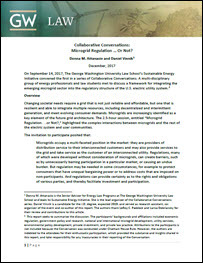 Regulations, many of which were developed without consideration of microgrids, can create barriers, such as by unnecessarily barring participation in a particular market, or causing an undue burden. But regulation may be needed in some circumstances, for example to protect consumers that have unequal bargaining power or to address costs that are imposed on non-participants. And regulations can provide certainty as to the rights and obligations of various parties, and thereby facilitate investment and participation.